Unlike meat marinades, fish doesn’t improve the longer you leave it. The delicate flesh of the fish can only take a small amount of marinating, so do keep to the times suggested. Combine all the marinade ingredients together in a large bowl. Add the tuna and turn to coat. Allow to marinate for no longer than 30 minutes. Meanwhile, to make the guacamole, combine all the ingredients in a medium-sized bowl, making sure to mix through the lemon well so that the avocado doesn’t turn brown. Put the crème fraîche in a bowl and stir in the mint and the lemon zest and juice. Place the tuna on the hot barbecue and grill for 4 minutes on each side to cook it medium-rare. Add another 2 minutes on each side for well done. Place the burger buns on the barbecue for 2 minutes to lightly toast them. 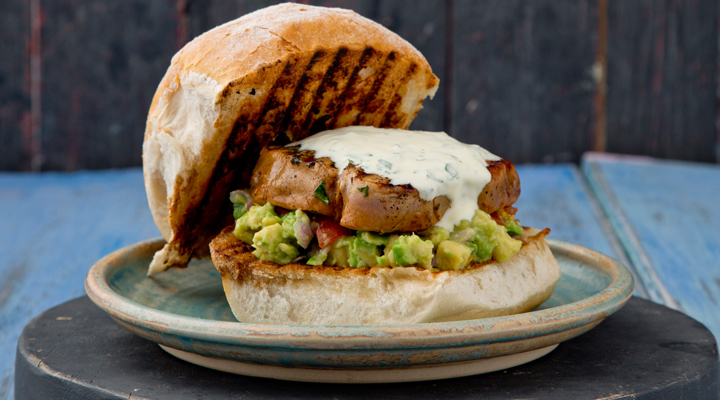 Spread some of the guacamole on the bottom halves of the buns, then top with a burger and drizzle over some mint crème fraîche. Serve warm.